BERLIN, Sept. 5, 2018 /PRNewswire/ — Honor, a young, trendsetting, innovative smartphone e-brand, won a series of awards at IFA 2018 for the “Crazy Fast, Crazy Smart” Honor Play. Honor’s first-ever flagship gaming device was praised for its GPU Turbo and smart features, including the AI-powered vibration and 6.3-inch notch screen for exceptional gaming experiences. 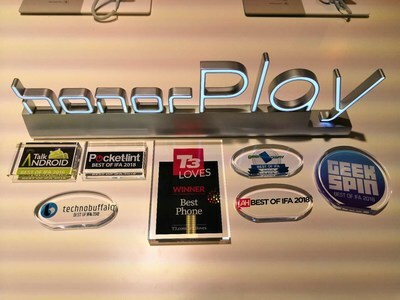 At IFA 2018, the Honor Play secured nine awards from top-tier industry media, receiving the “Best of IFA 2018” award from Android Headlines, Digital Trends, Pocket-lint, T3, and Ubergizmo, Gear Diary, Geek Spin, Talk Android and Technobuffalo. Android Headlinescommended the Honor Play’s superior performance and impressive affordability, while Digital Trends recognized its graphical quality and seriously smart AI camera. Pocket-lint praised the Honor Play for the graphic performance provided by the GPU Turbo and its incredible affordability. T3 commended its performance speed, 6.3-inch FHD+ screen and gamer-centric hardware and software. The mobile gaming device was also praised by Ubergizmo for its Kirin 970 processor with GPU Turbo which it said offers exceptional performance at a competitive price point. Gear Diary recommended gamers buy the Honor Play’s Player Edition for its extraordinary design, while Geek Spin praised the Honor Play for its outstanding performance, all-round features and affordability. Talk Android and Technobuffalo also recognized the Honor Play’s superior performance and presented the Honor Play a “Best of IFA 2018” award. On top of the IFA awards, the Honor Play also secured more than six editorial recommendations from top-tier industry media, receiving the “Digital Trends Recommended Product”, “Expert Reviews Recommended”, Pocket-lint’s “Editor’s Choice”, T3’s “Best Gaming Phone”, and the “Tech Advisor Recommended” and “Trusted Reviews Recommended”.